Chakras are human energy centers located in different parts of the body. Wikipedia depicts each one as, "center of activity that receives, assimilates, and expresses life force energy." The main function of the chakras, "is to spin and draw in this energy" (life energy), "to keep the spiritual, mental, emotional and physical health of the body in balance" (wikipedia). Whenever the chakras are not functioning properly, it is likely that illness will develop. To avoid the latter from happening, one must maintain a healthy lifestyle and way of thinking. It is vital to maintain the chakras clear and open. In addition, when the chakra flows normally or correctly, “a certain frequency is set up opening a person to psychic abilities or higher spiritual levels” (G.L. Paulson). 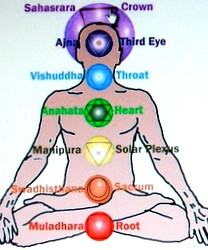 The body consists of seven main chakras or energy centers. Each one has a specific location, and a corresponding color. They begin at the base of the spinal column and move up to the top of the skull- (see chart on the left). Crown Chakra -the corresponding color is violet. It is related to pure consciousness, inner wisdom, spiritual awareness, and oneness with God. Third Eye or Brow Chakra- the corresponding color is deep blue or indigo. It is related to clairvoyance and dreams. Throat Chakra- the corresponding color is blue. It is related to verbal expression and relaxation. Heart Chakra- the corresponding color is green. It is related to the release of emotional issues and self-love. Solar Plexus Chakra- the corresponding color is yellow. It is related to awareness of self and others, personal power, fear, and anxiety. Sacral Chakras- the corresponding color is orange. It is related to relationships, addictions, emotional needs, and pleasure. Root Chakras- the corresponding color is red. It is related to grounding and security. Find the chakra that is blocked. Gently massage the area. If the area is too painful, "hold your hand over the chakra and send energy into it" or imagine, “the energy going from your hand into the chakra." Another method of cleansing the chakras is to lie down or sit. "Let go completely and let thoughts or feelings come to you. When energy is released from a chakra, information comes to your awareness; it may be a strong message, a memory of an incident, or an attitude. Let your mind ramble...If nothing comes and you feel comfortable with letting go, fine; but if you feel restless, uncomfortable or irritable you probable should continue...When cleansing is completed, you will generally experience a release of energy and feel refreshed and energized." The process usually takes from a few moments to thirty minutes. She recommends not stopping the process too soon. A woman told me of an exercise she would do whenever she felt that one of her spiritual chakras was blocked. She would find a place in her home where no one would disturb her, and sit in total silence with her eyes closed. Then, she would focus on the blocked chakra, and imagine the corresponding color penetrating the area. With each deep breath, she would imagine the color getting richer and powerful releasing any negativity and unblocking the chakra. By the end of the exercise, she would feel renewed. Another woman would cover her head with a violet-colored cloth whenever she felt her head heavy with negative thoughts. After a while, she would feel a sensation of calmness and peace in her head as well as her body. She said," It is my way of clearing my head chakra." A spiritual medium revealed to me that when she engaged in any spiritual work, she would cover her head with a violet-colored cloth. She believed it kept her head chakra clear causing her to be more spiritually aware. For further information on Spiritual Chakras read, The Chakras by C.W.Leadbeater and Kundalini and the Chakras by Genevieve Lewis Paulson. If you loved the stories in this website purchase the above books and continue the adventure.